Hi girls!! Continuing with my holiday theme, today's post is all about decoration. I've chosen two of my favorite holiday statement necklaces from Ily Couture and paired them up with understated makeup to bring you two looks that are festive and easy to wear, no matter what your style is. As a bonus, I've teamed up with Ily Couture to offer you a special treat, read below for details! Read more for tips, deets & a special deal! Pair this fun sparkling piece with neutral separates, cozy sweaters or your favorite tee. My Look: Sweet, pink and über girly. 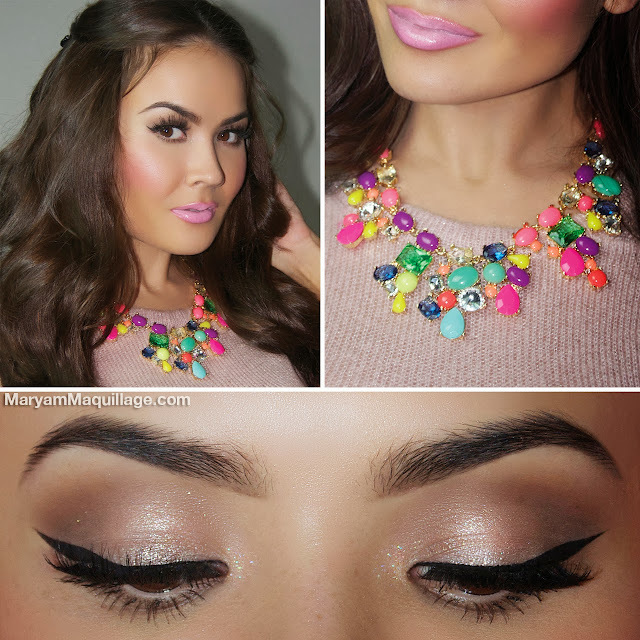 I paired my necklace with a pale pink cropped sweater, neutral sparkly eyes and various shades of pink on the lips and cheeks. Hair: Princess-y & disheveled. I'm wearing Bellami 220 g / 22 inch Remy Hair extensions in Dark Brown. Pair this ultra glam floral piece with anything black, white or striped for an extra pop. My Look: Easygoing, dressed up grunge. I dressed up my favorite skull T-shirt by dressing down the turquoise necklace and transforming the skull into a catrina calavera. Hair: Easy, textured and pulled to the side. I'm wearing Bellami 220 g / 22 inch Remy Hair extensions in Dark Brown. I love these necklaces! I plan to start my own custom jewelry/accessory brand sometime in 2014 :D. You look so pretty...great post. She is looking awesome with these different "necklaces"..!! I love these designs. I love both of your necklaces they are so cute! Holiday Makeup & Nails: Sparkly from head to toe! Glitter "Border" Liner for the Holidays!